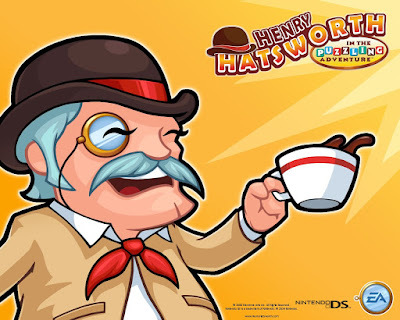 I have slowly been making my way through Henry Hatsworth In the Puzzling Adventure. It is probably the most brutal game (in terms of skill-based difficulty) I have played since the Bit.Trip games. Somewhere around World 3, the difficulty curve becomes a sheer cliff. Being the kind of person I am, I see this as a personal challenge. Maybe it is the completionist inside of me, or maybe I just cannot bear to see Hatsworth's cute little imperialistic ventures thwarted, but I have resolved to see this thing toward the end. The stage timer has seemed to fall out of favor in modern gaming. Games from the original Super Mario Bros. generation often added pressure to the gameplay by imposing a time limit on the stage. While Hatsworth does not do this explicitly, the puzzle section on the bottom screen performs this function: As enemies in the top screen are defeated, they wind up in the bottom screen as meddlesome blocks. Left unattended , they work their way back up to the top screen and attack the player. Some of the stages boast large environments to explore, but their treasures will be missed if you let the puzzle chase you out too soon. By effectively managing the puzzle, you are in affect rolling the stage clock back and choosing to travel the stage at your own pace. As I mentioned earlier, the difficulty spikes sharply around the game's half-way point. One of the game's favorite tricks is to send hoards of different types of enemies appear simultaneously to attack you in unison. Even if you manage to vanquish them, their afterlife in the puzzle means they will come back to haunt you. Soon, both screens are inundated with threats. It is tempting to watch the puzzle like a hawk and try to eliminate enemies as soon as they turn into blocks. However, the fact that you can freeze the platforming action at any moment does not always mean it is a good idea. Many enemies have specific attack patterns, and even a few minutes away from the action can be disorienting: Does that enemy have two fireballs left, or three? Is that airborne enemy on his way up or down? Oh, wait: I'm in the air! Am I starting or ending a jump? Success requires you to monitor the puzzle while having the discipline to stay out until it is strategically logical to clean it out. This mindset requires confidence that, no matter how tricky things look, you will be able to fix the situation before it deteriorates. By clearing blocks in the puzzle, you build points used towards activating a hilarious and deadly steam punk mech. Enemies in block form give you more power towards your special attacks, making what at first seems like a punishment a boon to clearing difficult levels. When you are running out of health, seeing enemies becomes a relief. I soon found myself purposefully allowing enemies to build up in the puzzle, as I viewed them as tools rather than impediments. Some of Hatsworth's enemies have irritatingly strong attacks, but their consistency is their downfall. Every enemy has precise attack patterns and ranges. As these do not vary, you can practice and refine your technique until you can implement it flawlessly. If you die, it will not be because something unexpected happened; instead, it is because you flinched in the face of the enemies' brutal predictability. Additionally, if you find yourself dying repeatedly, it may point to a resource allocation issue. Weapon and ability upgrades can be purchased in between levels, but determining which abilities would most help your situation can be tricky. While it may seem like trying to stock up on hearts will prevent deaths, I found that buying offensive upgrades meant I could dispatch enemies before taking damage. These quasi-RPG elements made deaths more thought provoking than those in traditional platformers, as I was forced to determine the elements contributing to my failure. Admittedly, these mantras have not completely eliminated the occasional expletive-laden outbursts I shout while playing the game. Nor have they changed the fact that I have been stuck at 79% completion for days now. However, I have confidence that seeing the end credits is a more of a matter of "when" than a matter of "if." With the power of positive thinking, what could possibly stop me? This game pretty much had me completely enthralled from beginning to end. If you are going to "cheat" on one thing, look up how to get to the secret levels. They are brutal, but pay great dividends in terms of suit pieces and treasure. Also, don't be afraid to pause and exit a level while in the midst of a "poppycock!" KO: You won't lose a life, but you will start the level again with the same subweapon you had. Thanks for the pep-talk. I'm chipping away at it. I didn't know about the "poppycock" trick; that will probably come in quite handy. Onward, to victory! This game is DIFFICULT but very addictive. Right now I'm stuck on the boss of Atlantia. Someone posted a youtube video of their battle with the old man and his big nurse... I really don't know how I'm going to make it beyond this one. With enough patience, practice, and grinding, I'm sure you'll be able to get there. The nurse battle was really fun.